We are often encouraged to apply feeds and fertilisers to plants in our garden. 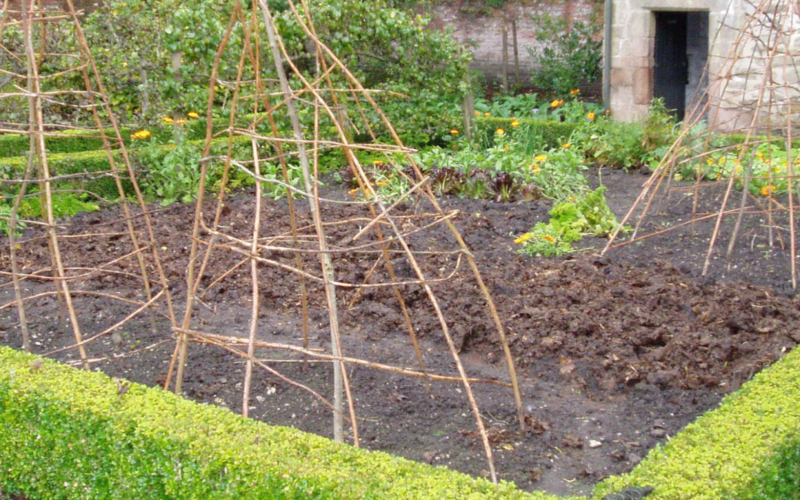 However, mulching can create the basic foundation for happy and healthy plants by improving the soil. If you’re lucky, you may have a garden with beautiful crumbly soil where earthworms burrow and the water drains away easily; you will probably have inherited a well-worked garden or have put in the hard work yourself! Unfortunately, many of us up here in Lancashire have gardens with heavy, wet and cold clay soil (often with stones and other rubble included!) that needs plenty of improving! you should use ‘organic’ mulches. These are materials made out of materials from living plants and creatures. This includes mushroom compost, animal manure, compost and tree bark and wood chippings. What does your soil need? Before improving you soil by using a mulch you will need to know what it needs. Try putting your UK postcode into the ‘Search’ box of this website to see what the underlying soil is like in your area…. hope that’s not too depressing! Poor drainage? – create larger air pockets that allow water to drain away with composted bark or wood chippings. Now you know what type of mulch you need you can start to add it to your garden. You will need a layer of mulch at least 5cm (2 inches) deep to have an impact on the soil. This is a good job to do in the autumn or spring when you want to keep warm in the garden! Using a fork or spade pile up the mulch around your flower borders or vegetable beds and then use a flat-head rake to level it out. Take care to make sure you don’t cover up plants or leave to mulch too close to stems or trunks as it could create rotting. Generally you should leave a small circle around the base of each plant so the mulch is about 5cm or 2 inches away from the stem. The good news is that you don’t need to fork or dig in the mulch – just leave it on top of the soil and the weather and worms will work it into the soil beneath it. Mulch every year and you will gradually build up a good quality layer of top soil in your garden that will nurture you plants and ensure that they grow well without the need for any shop bought fertilisers at all. Never add a mulch or any type when the soil beneath is dry – in those conditions the mulch just seals in the dry soil and stops it getting moist again. So don’t mulch in the summer or during dry periods in the spring or autumn. If you are new to gardening you might be interested in coming along to one of my workshops in Lancashire and Manchester; they are relaxed and friendly sessions aimed at beginners. I can also visit your garden to give you specialist 1-2-1 advice on how to improve or look after your outdoor space.